Hinges, in many ways, make the world go ’round. Without them, everything from your refrigerator to a cellar door would operate very differently. Next to the wheel, hinges could be considered the 2nd-most-important invention for humanity. When it comes to the most demanding types of hinges, industrial hinges play a crucial role in a myriad of settings where extreme strength and reliability are a top priority. As indicated, industrial hinges cater to large industries; and because of this, they are intended as non-consumer products. To clarify this, hinges you might purchase at a hardware store to hang a door in your home would not qualify as ‘industrial’. On the other hand, hinges that are used to secure body panels to a military vehicle, or strap hinges used to secure tall, heavy doors of a semi-truck would, indeed, meet the requirements of being labeled as ‘industrial’. By far, the most important consideration for any industrial hinge would be its function and the amount of strength required to fully meet that function. When you see the term ‘industrial’, you can be certain the extreme durability of the hinge is of prime importance. In other words, the hinge will easily withstand not only continual use but, even, abuse. 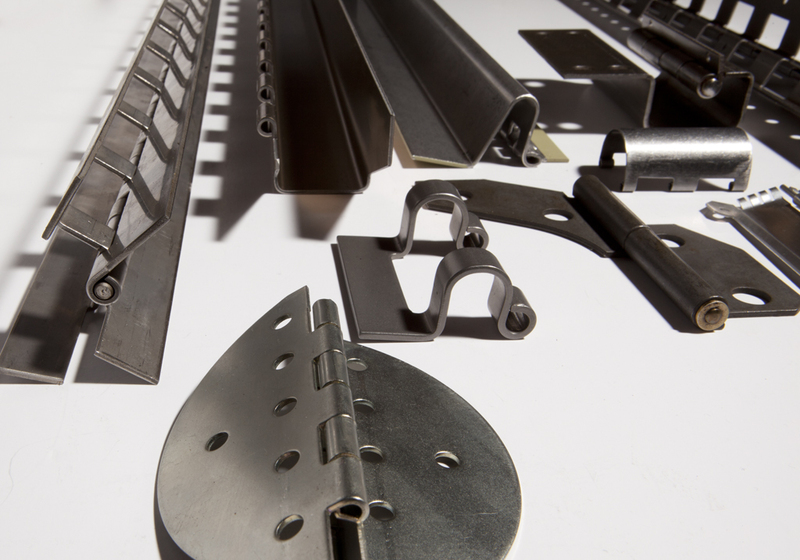 At Ladeau Manufacturing, almost 100% of our fabricated hinges fall under the category of ‘industrial’. Schools, hospitals, airports, stadiums, etc, use geared-continuous hinges where heavy doors must meet the demands of high-traffic entrances. Not only are these industrial hinges impressively durable and corrosion resistant, they meet building fire-codes when they are manufactured with a 3-hour fire rating. Elevated freeway and railroad viaducts used specialized industrial hinges that greatly help to reduce or eliminate the transfer of bending stresses between structural components. This is especially critical when the minimizing of sensitivity during earthquakes is required. This type of industrialized hinge is designed to prevent the separation of adjacent components. Heavy-duty gates, especially those fabricated from wrought iron, require hinges that offer immense load-bearing capacities. These types of industrial hinges provide years of dependable service and can be welded on, providing substantially-enhanced security benefits. 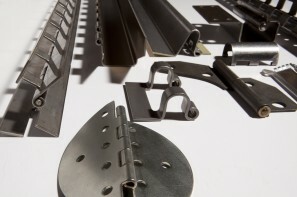 Weld-on hinges are commonly used on armored vehicles, prison gates, vault doors, shipping containers, etc. Medical facilities require the use of industrial hinges that offer high-capacity performance. Radiology, oncology, and research labs include only a few settings where heavy-duty hinges that provide strength and seamless, maintenance-free operation are an absolute prerequisite. One such example would be neutron (radiation)-shielding doors for radiation-therapy rooms. These types of hinged doors allow for primary and secondary shielding of neutron and gamma radiation. The hinges, themselves are designed to operate under harsh and extreme medical environments. The performance of the hinges is enhanced via the use of seals that prevent contaminants from entering the hinge. Also, heavy pivot door hinges are equipped with precise thrust bearings that are capable of carrying tremendous load demands. When one considers some of the first “modern” hinges were used for King Soloman’s temple dating to at least 600 B.C., one has to marvel at the evolution of this simple, yet fascinating piece of hardware.